Two horse trainers were seriously injured trying to save their own and others' horses at a stable in Bonsall when a fire erupted Thursday morning. Horse trainers Joe Herrick and Martine Bellocq suffered burns to their body while trying to rescue some of the hundreds of elite training horses stabled at San Luis Rey Downs in Bonsall. As of Sunday, the total number of horses that died in the fire is 46, according to the California Horse Racing Board. Bellocq’s brother-in-law told NBC 7 she suffered second and third-degree burns on over 50 percent of her body while trying to save the six horses she had at San Luis Rey. She is being treated at the University of California San Diego burn center and is in a medically induced coma. She is reportedly in critical condition. Bellocq's daughter told NBC 7 this is a "very challenging time." Herrick suffered second-degree burns on his arms trying to save horses at the property, according to a family member. He is in serious condition. A third person was burned and another person needed medical attention due to smoke inhalation, but the circumstances leading to the injuries were not clear. Two firefighters were also injured. 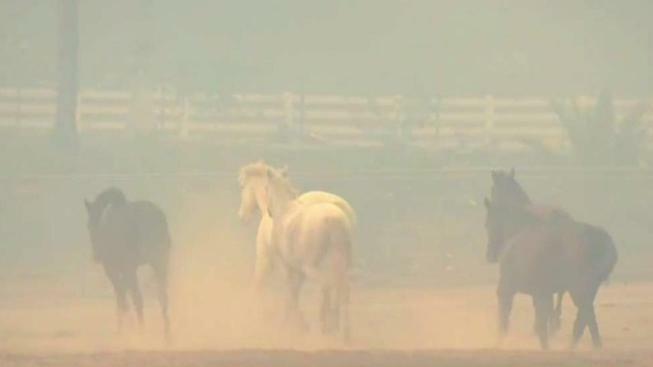 In the hazy confusion created when the brush fire broke out near the intersection of Interstate 15 to State Route 76 Thursday, horses worth hundreds of thousands of dollars that are usually carefully walked from place to place were simply set free and encouraged to run away. Many of the horses rescued were transferred to the Del Mar Fairgrounds. California Thoroughbred Trainers and California Thoroughbred Horsemen’s Foundation is raising money for the victims. To make contributions, visit CTHFcares.org.